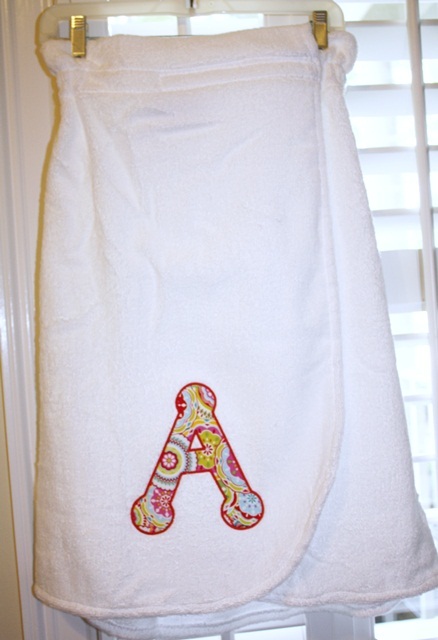 I’ve been asked a few times what I do/use to applique (not monogram) a towel (=terry loopy fabric). I was doing an applique on a towel today, so here you go! First, I iron on “Iron-on Tearaway” stabilizer. This happens to be Sulky brand, but any will do. I iron it on and it sticks long enough for me to hoop. As you can see on the corners, it doesn’t stick much, which is a good thing when it’s time to remove it. On top I use (and hoop) a water soluble topper. This particular stabilizer is by Pellon and I got it at Joann. 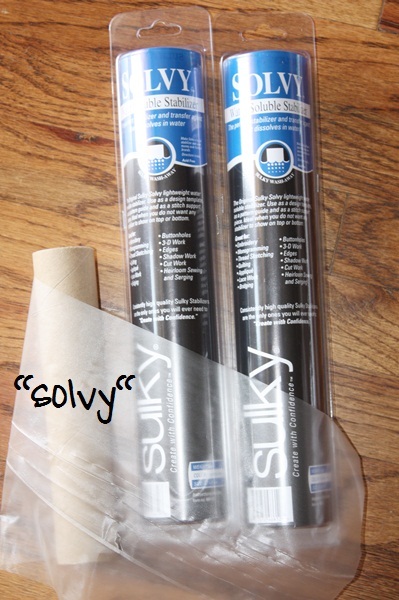 I have always used Sulky Solvy, but they hardly carry it at Joann anymore so I got the Pellon which works fine. Again, any water soluble topper will do. I don’t do a TON of towels (or blankets, etc), so it’s not something I keep in bulk. So I have iron on tearaway, then towel on top, then “Solvy” on top and all 3 are hooped. This is actually the corner of a wrap-around towel “sarong”, so I didn’t mark my center. I simply hooped the bottom corner where the applique was to go and started sewing. 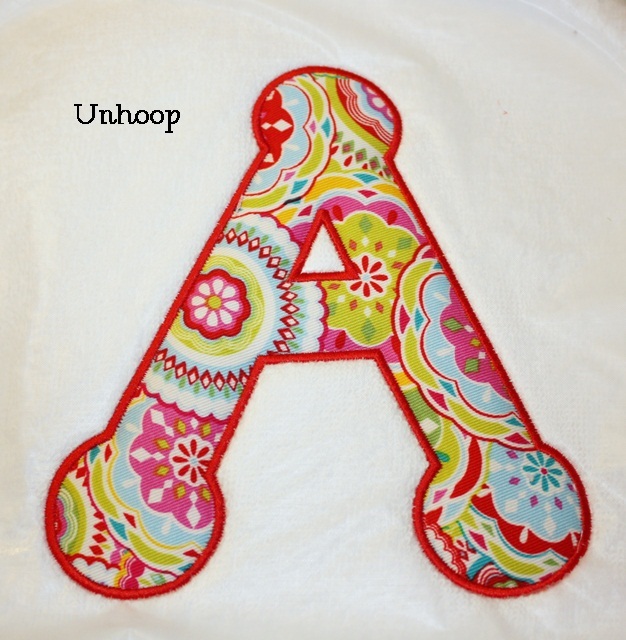 This is a Dotty “A” from Embroidery-Boutique. This particular A is 5.81″ wide X 6.63″ tall, so it is big. This applique alpha also comes in other finishes (vintage, zig zag and satin). So here I have done step 1, which is the marking stitch. It stitches right on top of the water soluble topper (aka Solvy). Since I’m doing an applique and using fabric (with Heat N Bond Lite on it), I’m going to remove the water soluble topper INSIDE the A only. That way the fabric with HNBL on it will be flush against the terry towel. This will come in handy when I’m done and am ironing the finished applique A. I started by poking a hole with my scissors and most of the “solvy” was removed by pulling it away inside the stitching. 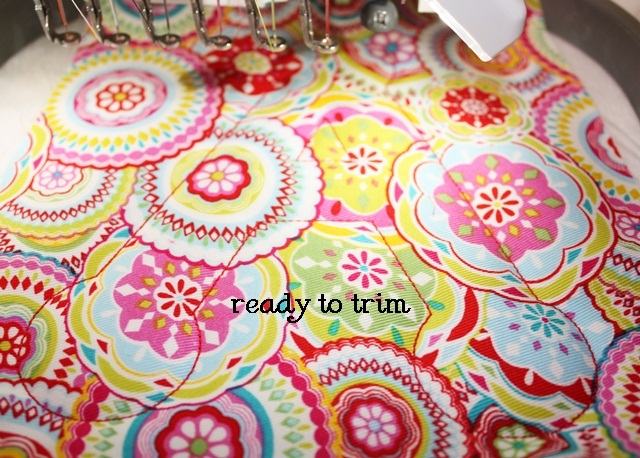 If it won’t pull away so easily, then just trim inside the stitching with your scissors. These are scissors that came with one of my machines. Remove all of the Solvy inside but leave it outside the stitching, which will come in handy when you are doing the satin stitch. 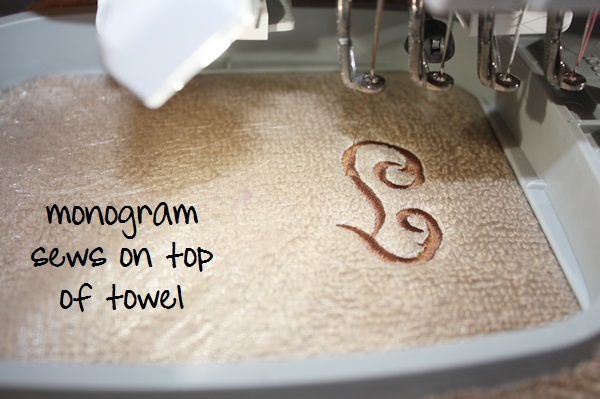 If you’ve ever monogrammed a towel with no Solvy on top you may know what I mean (I am guilty!). The satin stitch may or may not sink in to the terry loops. The applique fabric helps, but stick with Solvy too just in case. I’m now ready for some fabric. Ironing my fabric so it’s nice and flat. Ironing my HNBL on to my fabric. Peel away the HNBL paper which will leave the shiny HNBL layer on the back side of the fabric. I’m now ready for step 2, the tackdown stitch. I am now ready to trim around the tackdown stitch. 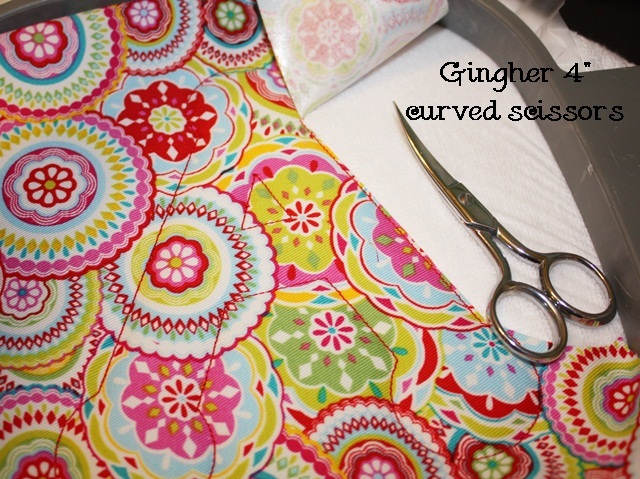 I use Gingher 4″ curved scissors (from Joann). I’ve also heard that Havels work well. I trim closely around the satin stitch. The HNBL helps it to be a “clean cut” as you can see. I also removed the little triangle inside the “A”. I am now ready for the satin stitch. 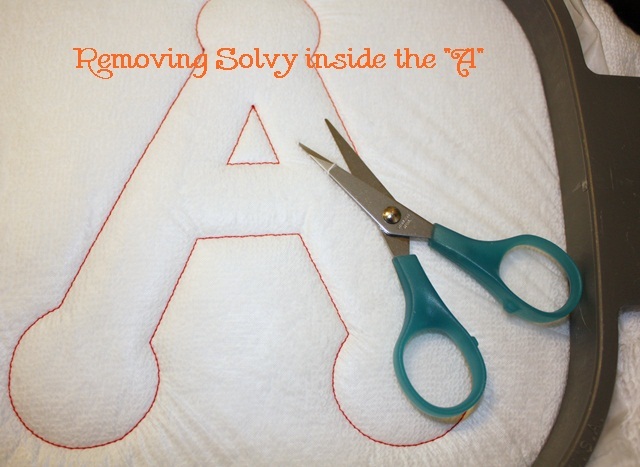 You’ll notice the Solvy is still around the applique. Ready for step 3, the satin stitch. 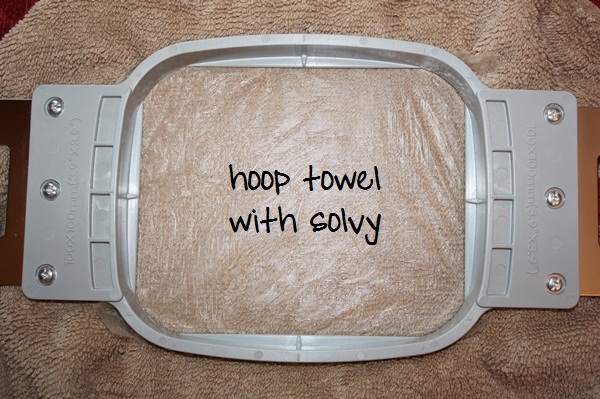 I now unhoop the towel and pull away the water soluble topper (aka Solvy) around the A.
I also remove the tearaway from the back. It pulls away very easily! Remove it from around the A as well as inside the A. My applique is done and ready to iron. This will “set” the HNBL and fuse the fabric to the towel. Here is the finished product! This is a graduation gift for a customer. This is the ever-so-popular Hobby Lobby fabric I found several months ago (and bought 1/2 yard of). It’s no where to be found that I know of! 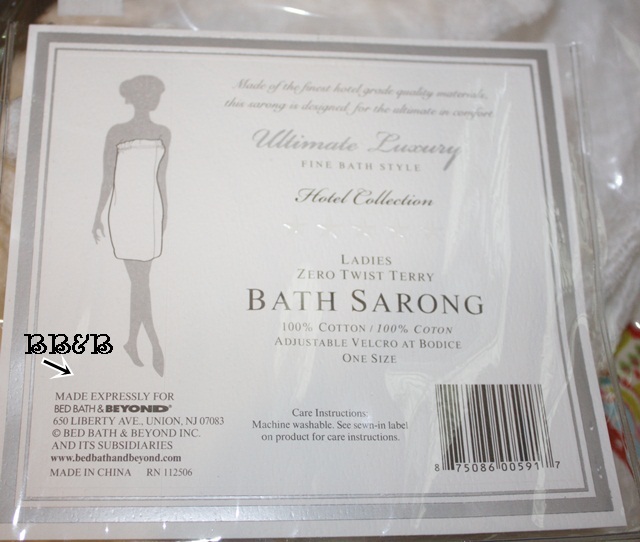 Here’s the packaging for the “Sarong”. Bed Bath and Beyyyoooonnnnddddd for $19.99 ~ always take a coupon! It’s a nice gift for any girl going off to college. I hope this helps! As always, this is my way, not the only way! This seems to work well for me so I thought I’d share. Have a great day! p.s. I forgot to mention this is a Durkee 9×9 hoop that I used! 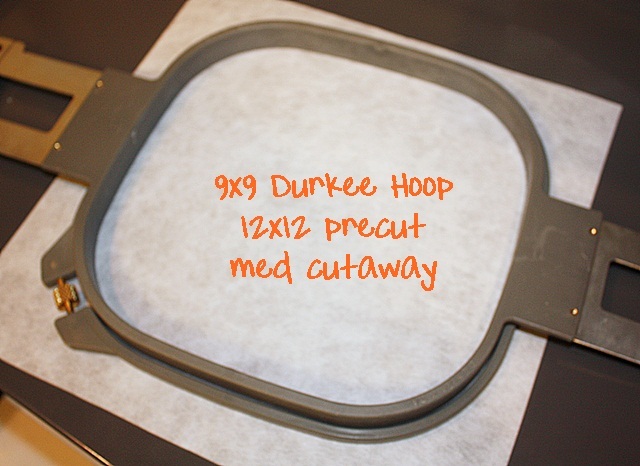 Check out Helpful Posts to read more about the Durkee hoops. I had a couple of people ask me what was in my “Favorite Things” giveaway basket at the Everything Applique Conference this past weekend. I hope these are in a somewhat logical order, but if not, you’ll get the idea! I’ll also try to reference where everything came from. 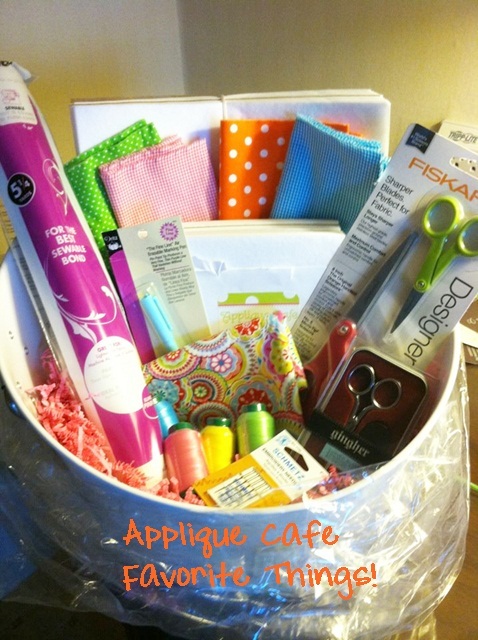 First of all, here is a picture of my door prize ~ Applique Cafe’s “Favorite Things” basket. The basket, or Angled White Beverage Tub, came from Target. If I knew how to use my vinyl cutting machine, I would have adorned it with lime and/or pink polka dots! The cellophane basket bag came from Michael’s and the Raffia came from an Etsy store. I also used hot pink crinkle cut paper filler from Caffco Floral Outlet. (I had a lot of fun doing door prizes). The AC stickers came from Zazzle.com! The winner of my basket, Demonica, posted this photo on Facebook. If you’ll remember my last post, she rode from New Orleans to Birmingham on a TRAIN! I just think that is so awesome and fun! She said it was very relaxing and gave her some quality time away from the family to rest and do a little work on her laptop (in the sleeper car). I honestly had no idea you could ride a train anywhere, so it’s even cooler that she rode a train to come to the Everything Applique Conference! Now on to the basket… I included my go-to stabilizer, 12×12 and 8×8 2.2 oz precut medium cutaway stabilizer squares. Both of these came from Sewingmachine.com. Check out all of their “commercial backing” and you can narrow down your search by the type of stabilizer you are looking for (cutaway, precut squares, tearaway, etc.). 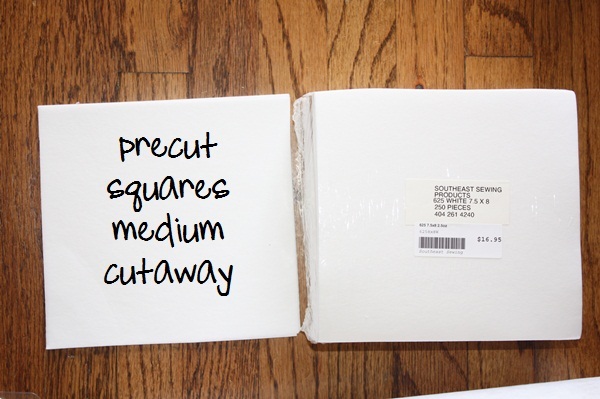 Click HERE for precut squares. They come in a variety of weights, but I like the 2.2 oz, as it is not too thick or heavy. I have used 2.5 oz as well and it’s not too heavy either. Their commercial cutaway also comes on the roll, but the squares are really convenient. The 12×12 squares are great for the Durkee 9×9 hoop and also the 5×7 hoop. 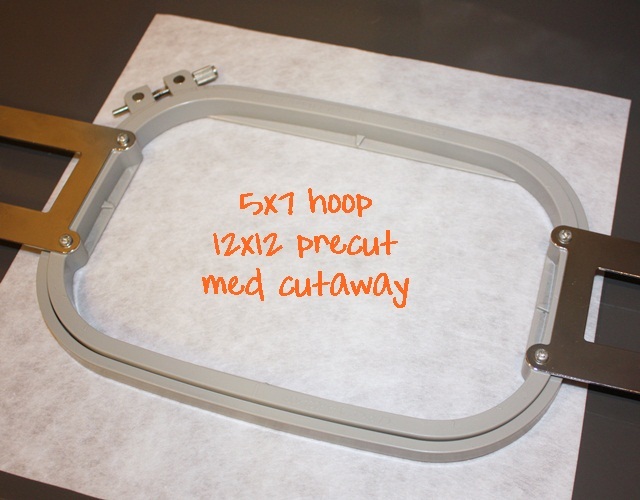 Check out this post for more info on the Durkee Hoop, which is compatible with most multi-needle machines. You can use the entire 12×12 square for your 5×7 hoop, or cut a few inches off before you hoop. Now on to Sulky KK2000 spray. This is a temporary spray adhesive that I use to “stick” my cutaway stabilizer to the inside of my shirt before hooping. It keeps the stabilizer in place so I am able to hoop my shirt. I also use the 99 cent tape measurer from Hobby Lobby! I keep one in my purse as well ~ you never know when you’ll need to measure something. When I do a shirt, I measure from armpit seam to armpit seam and mark my center. This distance is usually a good even measurement (14″, 12.5″ etc). 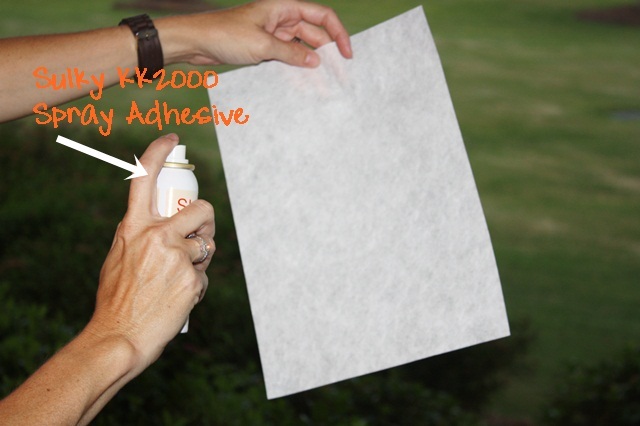 Spray adhesive can build up and make things sticky, so I recommend spraying it OUTSIDE. My sewing room is right by our front door, so I walk out on the porch and spray my stabilizer over the bushes. My bushes might be sticky, but at least my carpet isn’t! 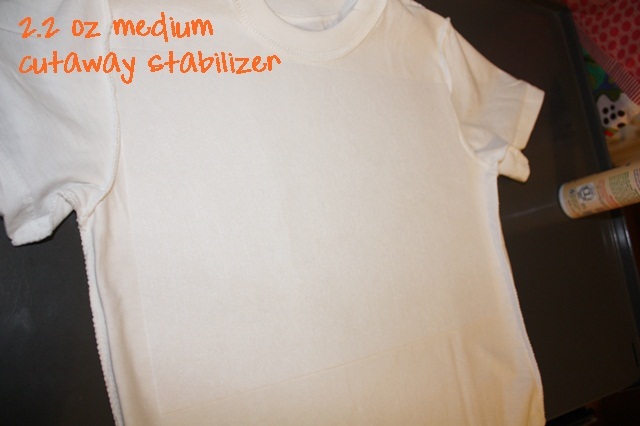 My shirt is inside out, I’ve sprayed my stabilizer with spray adhesive, and now I stick the stabilizer to the shirt. Turn it right side out and I am ready to hoop! 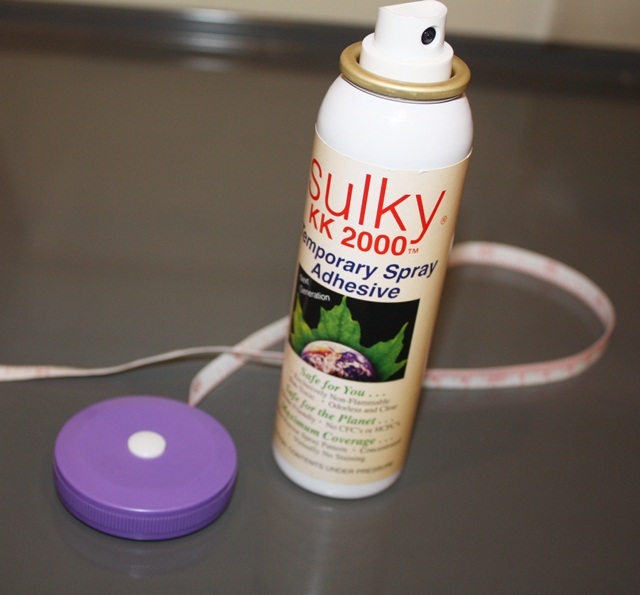 The Sulky KK2000 spray is temporary, so when I am finished appliqueing my shirt, it pulls right off so that I can trim the excess stabilizer around the design. See this post for more info on hooping. 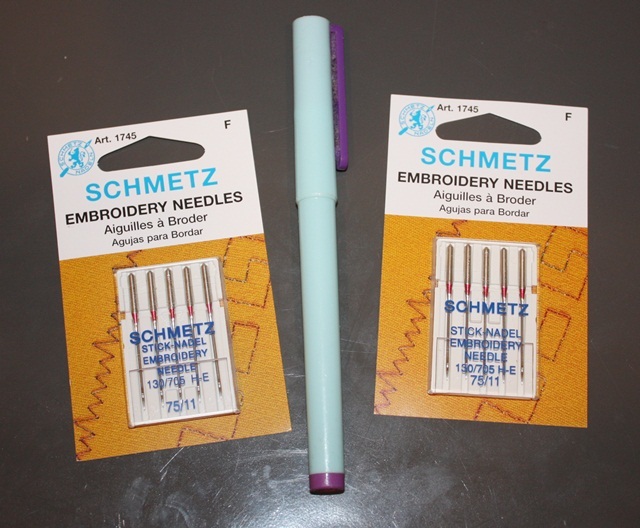 Also in my basket: Schmetz Embroidery Needles (75/11) and an air erasable pen. I use the air erasable pen (from Joann or any sewing store) to mark the center of my shirt (or bib, or towel, etc). It disappears with a little time, or you can also squirt water on the dot and it’ll go away. A wet Q-tip works as well. If I am marking the center of a dark item, such as a navy blue t-shirt or a fluffy blanket, I use a straight pen. Chalk would work as well. You may notice the lint buildup in the clip on my pen. I have had this pen since I started doing applique about 5 years ago! As far as embroidery needles, I use 75/11 needles for everything. Some people use ballpoint needles and some people change out their needles for various projects. 99% of the time I am doing samples or tshirts so this is the type of needle I use. You can get Schmetz needles from Sewingmachine.com, Joann (I stock up when notions are 50% off) or most any sewing store. Steve (Sewingmachine.com) recommends Schmetz, as they are the oldest needle company around. Basically they have been making needles for a long long, long long long, time! Bobbins ~ for my Brother PR650, I use the Fil-Tec Magnetic Core Bobbin. A box of 100 is $28, again at sewingmachine.com. I recommend any prewound bobbin, as the tension is consistent and it’s fast and easy to change out your bobbin. These were not in my basket since I didn’t know what kind of machine the winner would have, but I’m including them in my favorite things! Heat. N. Bond. Lite ~ check out this post on why I love this product!! You can buy HNBL by the bolt, in a box, on a small 3 yard roll, 15 yard roll, etc. Some people buy it at their local Walmart, but I have not seen it in Montgomery. You can buy small packages at places like Joann or Hobby Lobby. Sewingmachine.com sells it as well. I used to stock up at Joann when notions were 50% off, but lately I have not been able to find any there. 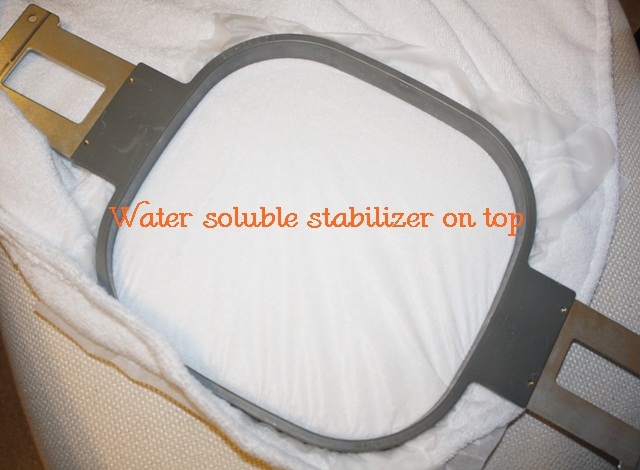 Wonder Under is another fusible product you can use, but I use and recommend HNBL. Instructions ~ very easy to use! Another item NOT in my basket, but still one of my favorite things (and a necessity in applique). The iron is your friend! 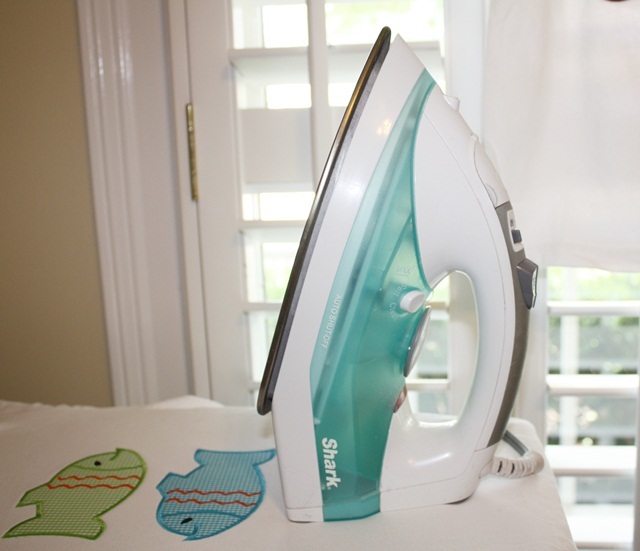 I have a Shark iron. It’s not fancy and yes, it leaks water sometimes. 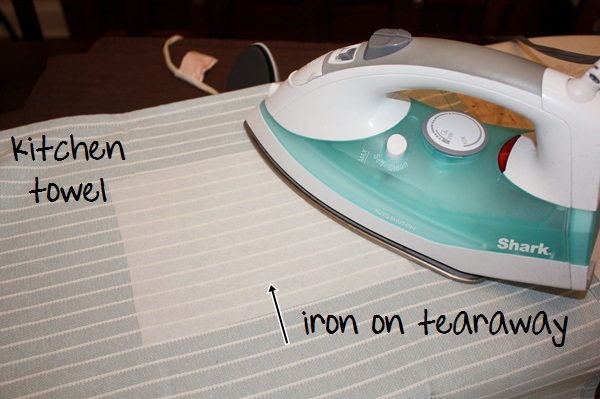 Iron your shirts, iron your bibs, use the iron for your HNBL, iron when you’re done. IRON!! Do you get hoop burn? 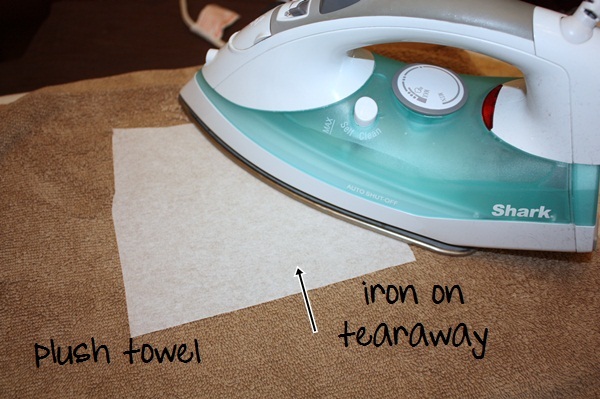 Squirt with water from your iron, iron over the hoop burns. They are gone! 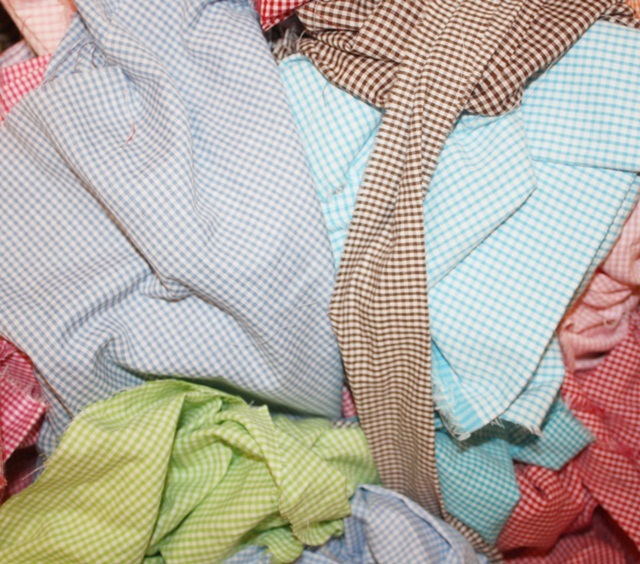 I see photos on Facebook a lot and it looks like someone took a picture of a t-shirt from the dirty clothes basket. 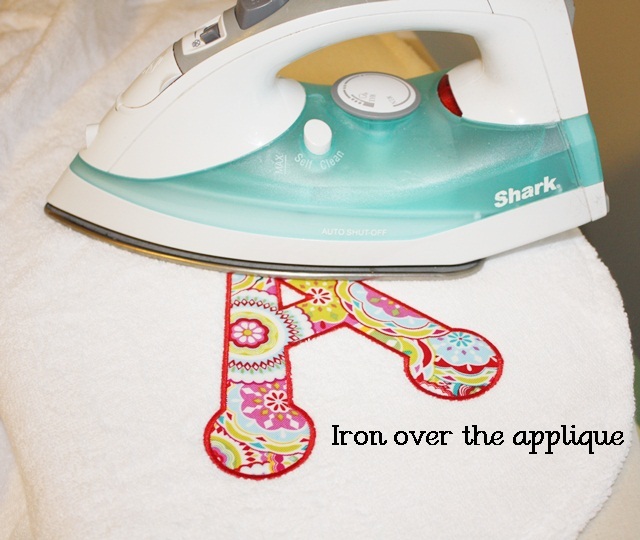 Ironing can make all the difference in your appliques, your pictures, etc! 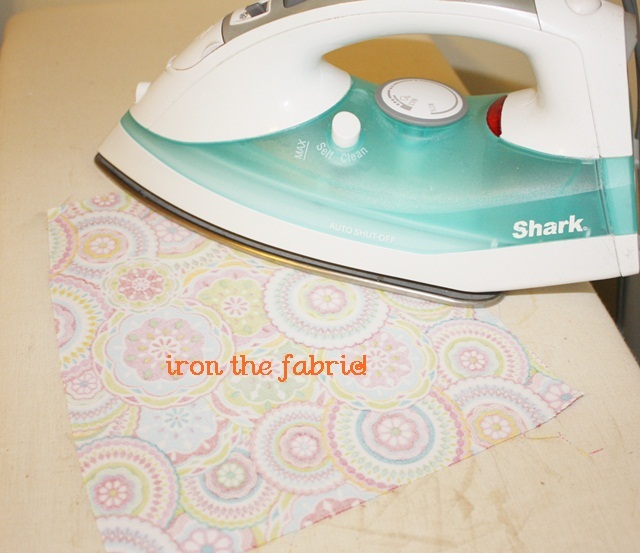 I hate to iron my own clothes, but ironing is so important when doing embroidery and applique. 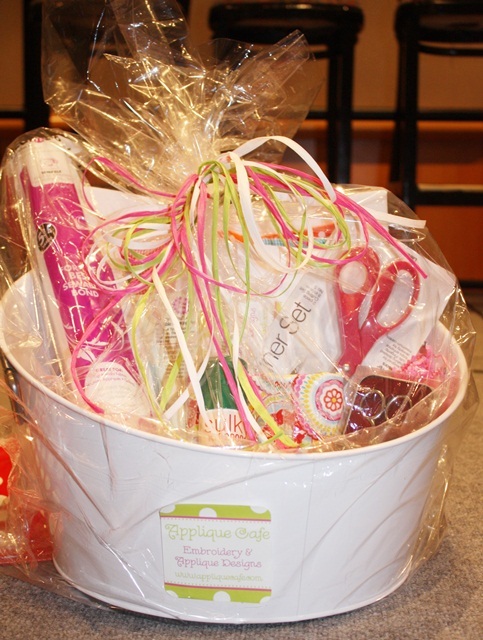 Scissors ~ I did include 4″ curved Gingher scissors in my basket, as well as a 2-pack of Fiskars fabric-cutting scissors. 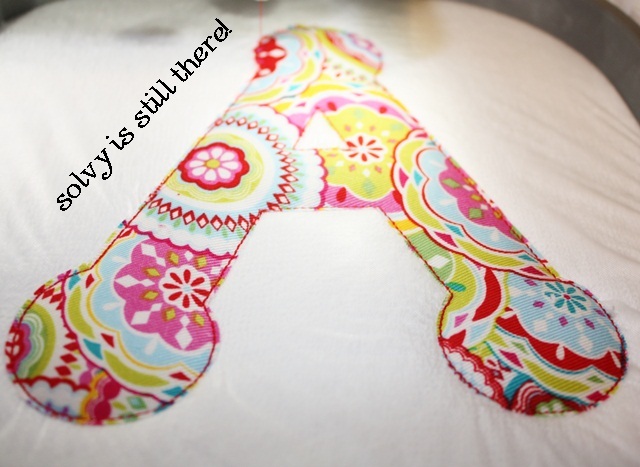 I use the Ginghers in the applique process only to trim the fabric around the tackdown stitch. 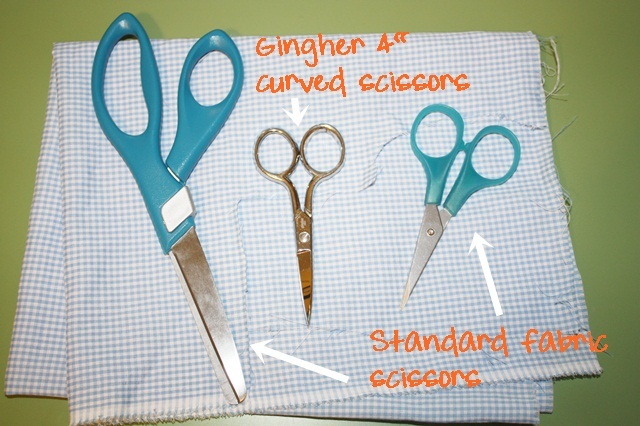 I use regular fabric-cutting scissors to cut fabric, to cut stabilizer, to cut ribbon, etc. You can never have enough scissors! p.s. I got my Ginghers at Joann and you can usually catch them on sale or use a coupon. The Ginghers are great for trimming closely around your applique! 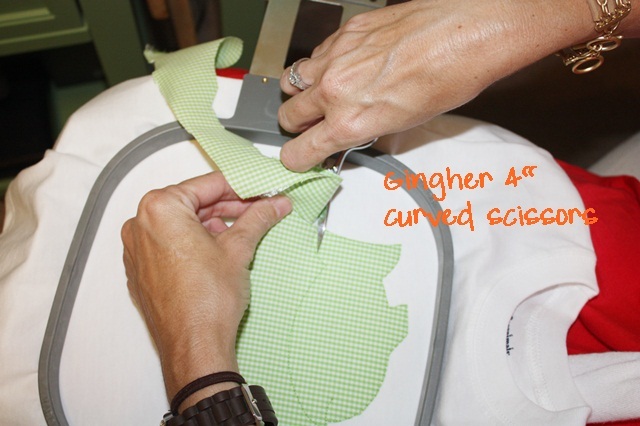 The curved end helps you to NOT cut a hole in your shirt (been there, done that, got the t-shirt)! As you can see here, I trim very closely. I do this with the help of a) the scissors and b) the HNBL on my fabric makes trimming easy and CLEAN! This design is ready for the satin stitch! There were also a few fabrics in my basket. I typically buy 1/4 yards of fabric since a little goes a long way when doing applique. 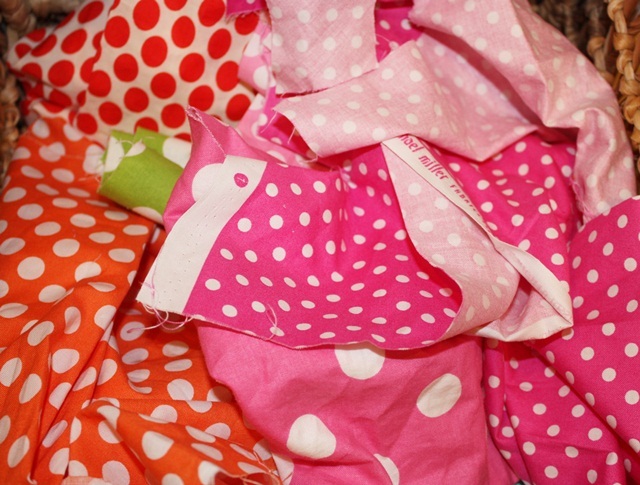 I LOVE polka dots, ginghams, stripes and small florals and prints for applique! 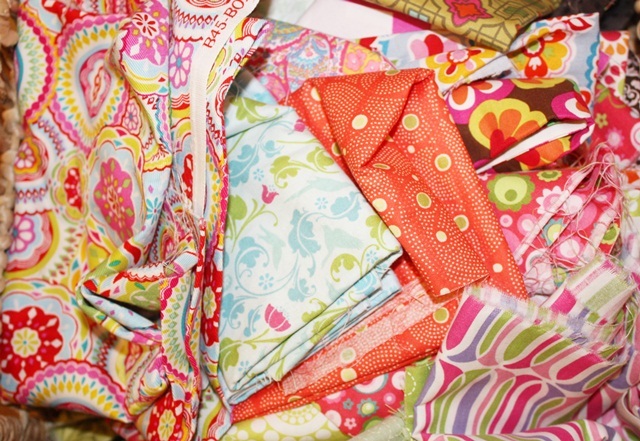 These are all my GO-TO fabrics, as you can probably see in my design sample photos. You can’t beat good ginghams, and try to avoid the cheap thin ones. 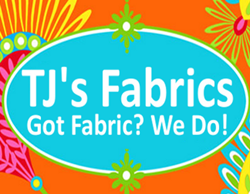 Fabric Finder brand ginghams are great! One more item that I should have included in my basket but didn’t have time to get… a REAL thread chart! This is the Isacord real thread sample thread chart. 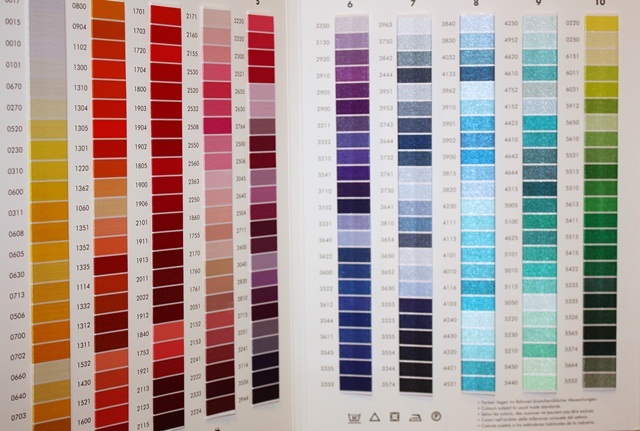 I also have the Exquisite (formerly Poly-X from Kens Sewing Center) thread chart and use them both. 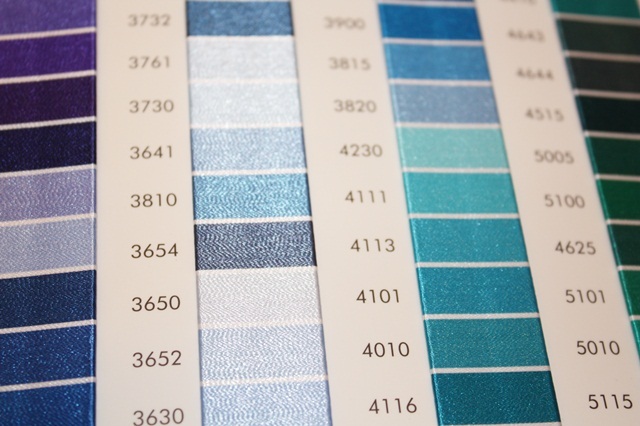 We all know the color print charts are impossible to match as well as the color square on your computer screen. These charts are usually $10 each and are well worth every dollar when you are searching for thread to match that funny colored peach dress. Another tip that I NEED to do ~ mark, circle or underline the colors you have on the chart. That way if the sticker comes off of the top of your spool of thread (which happens to me all the time), you have a record on your chart of which colors you have and like! There are probably a few more things I consider my favorite things, but that was about all I could fit in the basket! 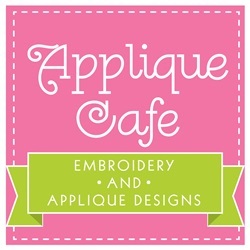 If you have any questions please comment or email me ~ rosemarygulledge@appliquecafe.com! 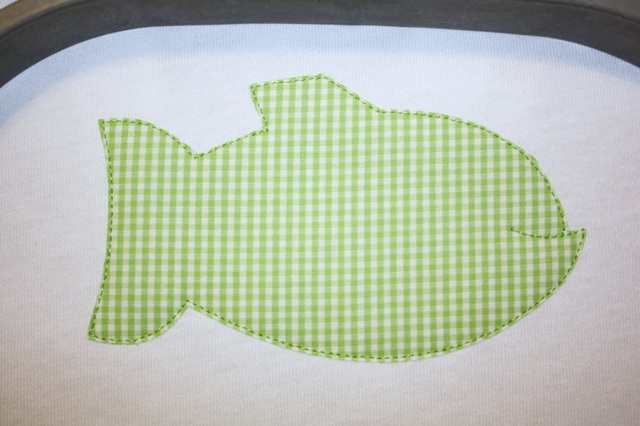 A lot of these things were discussed in our class, Applique the Right Way! Disclaimer: The following are stabilizers that I (Rosemary) use. There are GOBS of stabilizers out there and lots of different brands, types, shapes, sizes, colors, weights, etc…. These are the ones I like to buy so I’m posting about them! 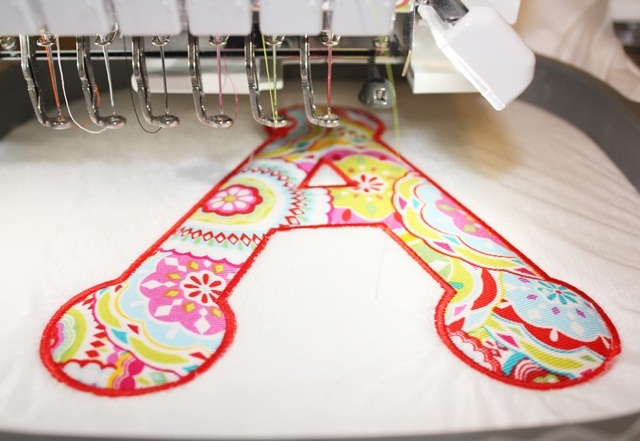 For those of you who have been doing embroidery forever, you might find this post boring! 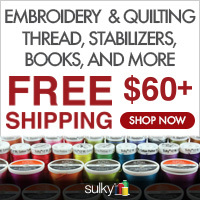 But, for those of you who are looking to get in to embroidery or are just starting out and learning, then this post is for you. As I’ve said before, I taught myself machine embroidery and “figured” stabilizers out mostly with trial and error (and messing up a time or two). 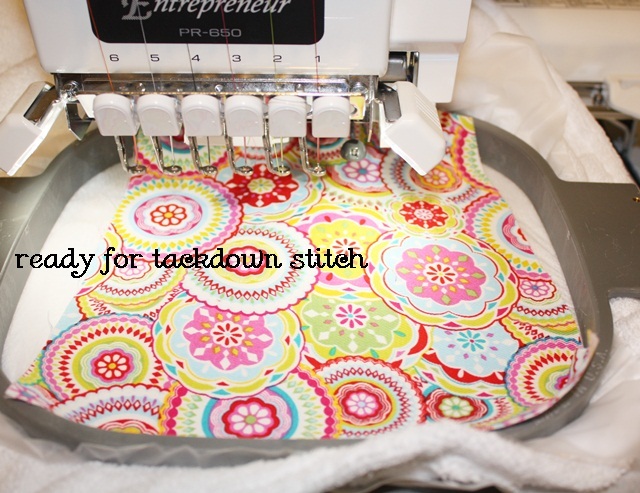 I get lots of questions about stabilizer and see it a lot on Facebook, so here goes!! #1. 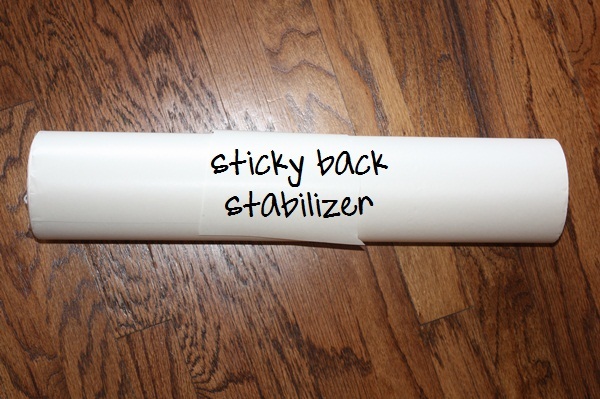 Sticky Back Stabilizer. 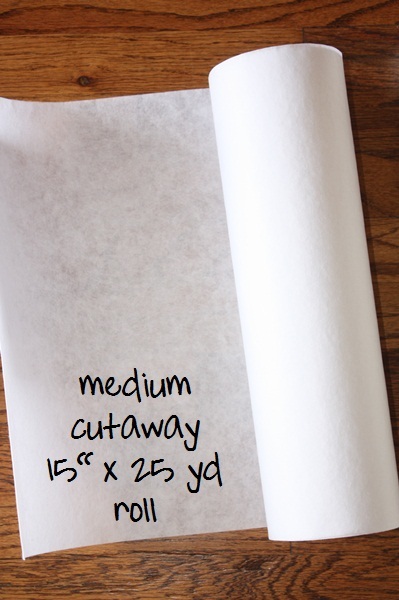 I’m not going to elaborate too much on this one since I just did a post on this stabilizer and it’s use with Fast Frames ~ http://appliquecafeblog.com/fast-frames/. Basically it is used for any item you can’t hoop. Examples would be: backpacks, lunch boxes, ribbon, market totes, etc. Some people use it for everything but I only use it for the mentioned items – basically things that you a) can’t hoop and b) you do not want stabilizer left on when you’re done (it peels away). 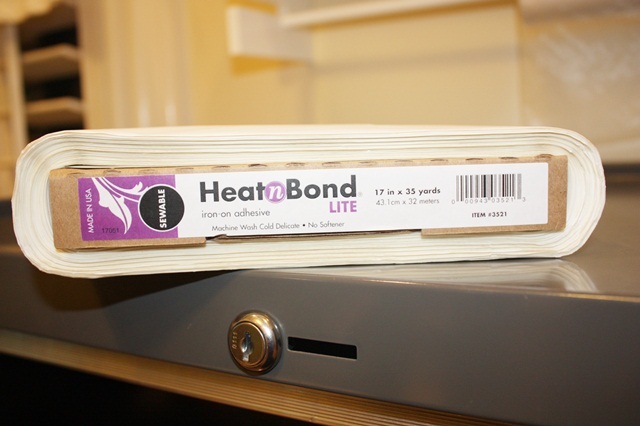 You typically hoop the sticky with the paper still on (or stick it to your fast frames) and then stick your item to the sticky (score the paper and peel it away) and pin it in place. Again, see the fast frames post for more details. I buy mine from Sewingmachine.com. This is a commercial roll and very affordable. #2. Medium Cutaway ~ This is Sulky Brand (Medium Cutaway) Cutaway Plus. I usually buy it with 50% off coupons from Joann. I like the commercial cutaway from Sewingmachine.com, but I sometimes use Sulky for Applique Cafe samples (with a layer of commercial underneath) because it’s a brighter white and makes a good white background for my sample pictures. I’ve used Sulky since I first started doing embroidery so that’s also why I like to keep it around! I also like Sulky because I can buy it locally from Hancocks or Joann and I can usually buy it with a coupon or on sale! #3. Medium Cutaway ~ this is the commercial roll from Sewingmachine.com. 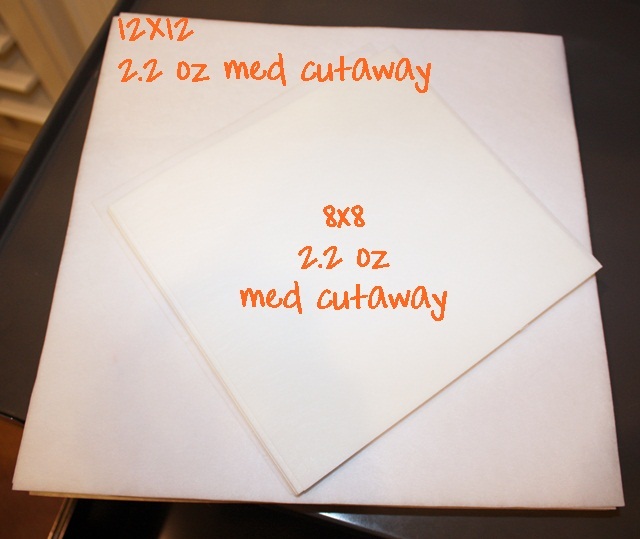 It’s very affordable and this size is great for your 5×7 or 9×9 hoop (see this post on the 9×9 hoop). I buy the 2.2 oz and it is medium cutaway. You won’t believe the great prices on the commercial stabilizer!! #4. Medium Cutaway ~ Precut Squares from Sewingmachine.com. I believe these are 2.5 oz and I also have the 2.2 oz which is a little lighter. These are great for your 4×4 hoop! They also sell other sizes and weights in precut. Just search “precut” for all of the precut stabilizer options (no show mesh, light tearaway, etc.) As you can see below, 250 pieces for $16.95 – great price! That’s like 7 cents a shirt ~ 250 shirts!! MORE ON CUTAWAY ~ I use cutaway on all of my tshirts. I am a “hooper” so I hoop all shirts and use medium cutaway. (See this post on hooping). Basically you would use cutaway on anything you don’t mind leaving stabilizer on, because you do “cut it away” from around the applique or monogram! 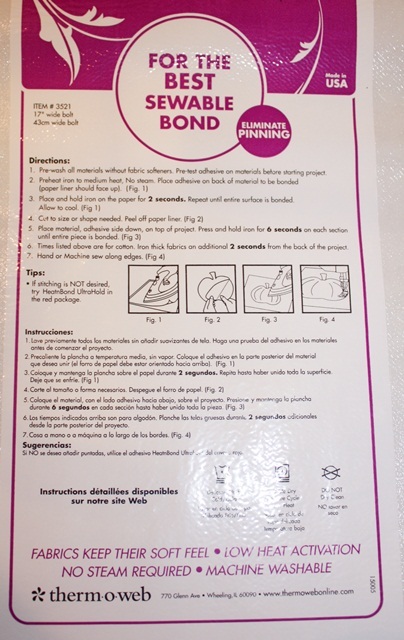 You would not use cutaway on a bib or towel, because you would not want it left on there when you’re done! I find that cutaway gives you great support too. #5. 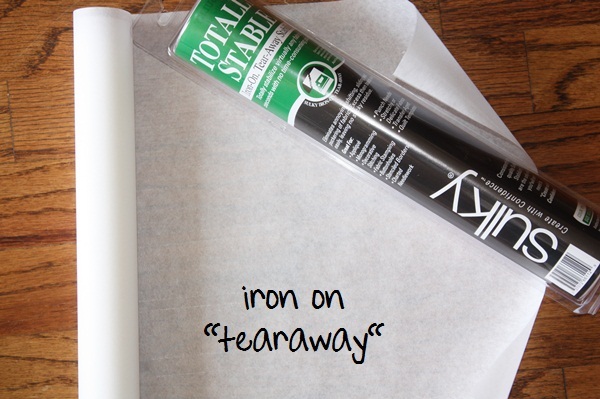 Iron on Tearaway Stabilizer ~ It is what it says.. You iron it on, then tear it away once you’re done! 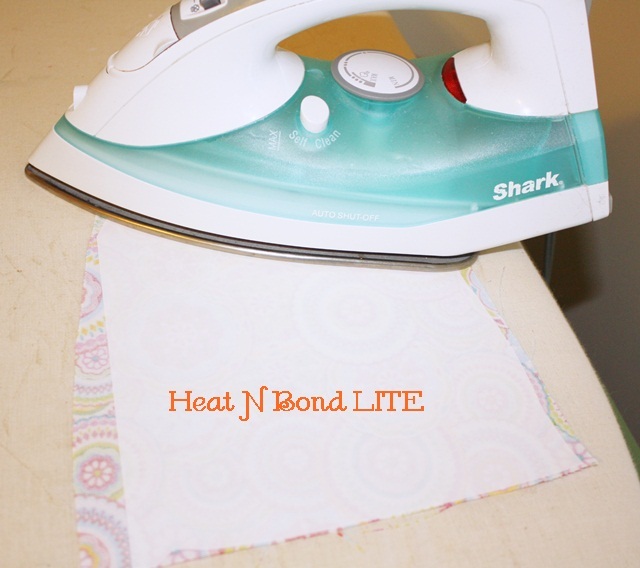 I use iron on tearaway on towels, blankets, plush items, lovies, bibs, burp cloths, etc. It’s basically like paper and once side is shiny. You iron on the paper side and it sticks to your item. When you’re done, you just pull it off. I don’t use it a whole lot, so I usually buy this Sulky brand from Joann with my 50% off coupon. #6. 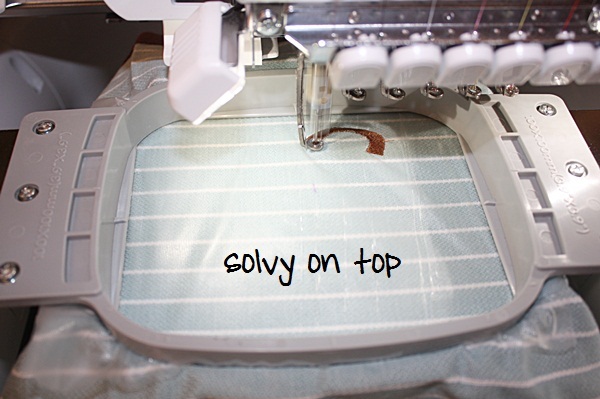 Solvy ~ Solvy is the stuff that is a “topper” stabilizer for plush items such as towels, blankets, terry bibs, minky dot anything, etc. When I use iron on tearaway, it’s typically something I’d need Solvy for too. It acts as a topper so that your monogram (thread) will not sink in to the item. 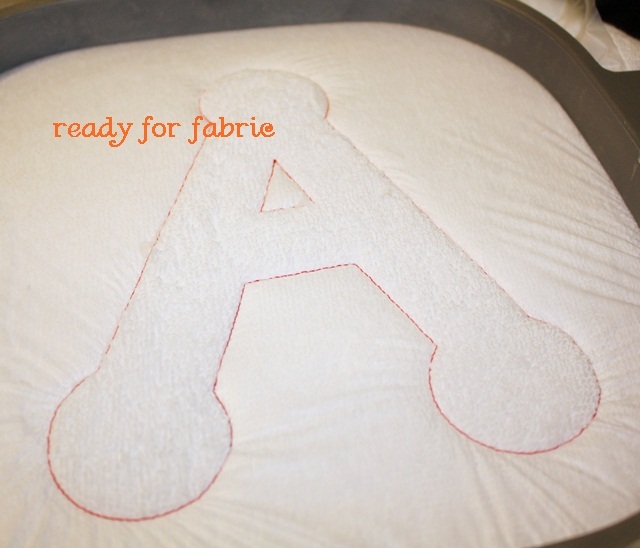 I learned this by monogramming a plush baby blanket and did not use anything on top. The monogram got lost down in the fluff! It feels sort of like a textured saran wrap. 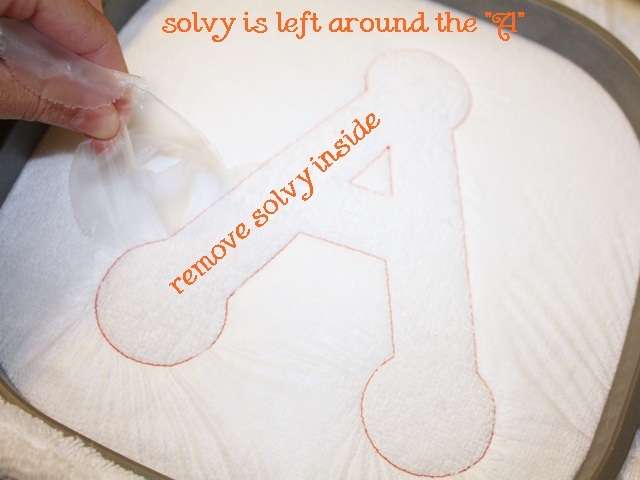 Solvy is water soluble too and the instructions state that it can be removed by submerging in water. However, like the tearaway I just peel/pull it off when I’m done. 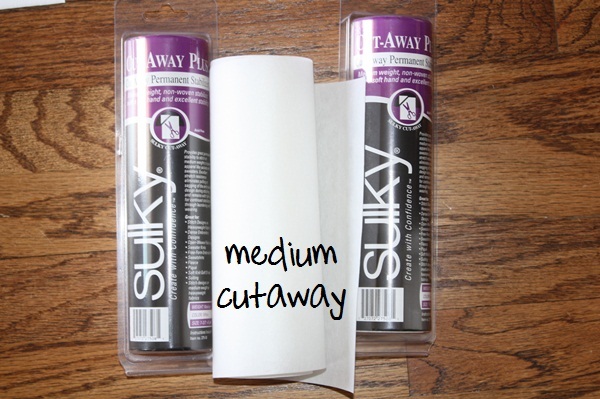 Like the tearaway, I don’t use a ton of it so I typically buy a roll or two of Sulky brand with my 50% off Joann coupon. 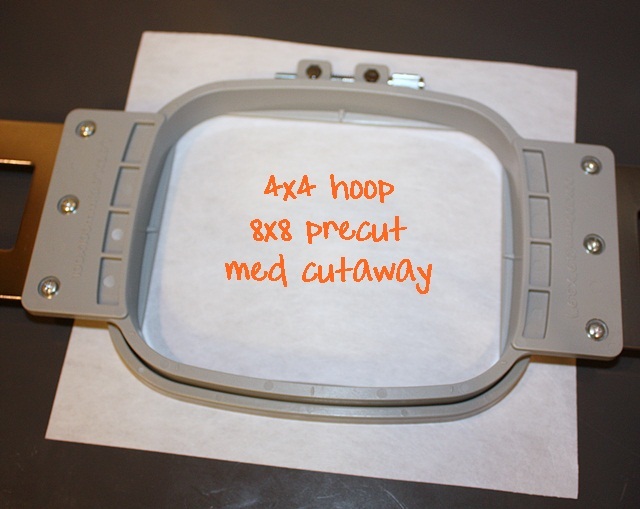 You can use solvy several different ways – you can hoop it with your item or you can lay it on top of your embroidery area and pin it in place. 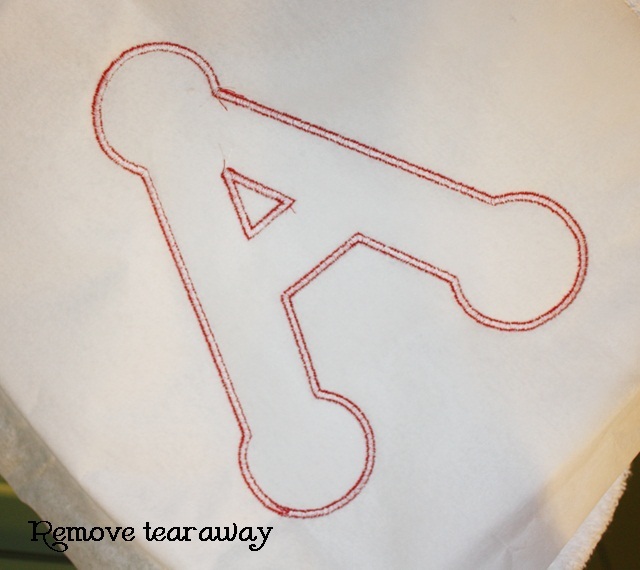 I monogrammed several towels today so here are a few pictures using the iron on tearaway and Solvy. First I’m doing a kitchen towel. 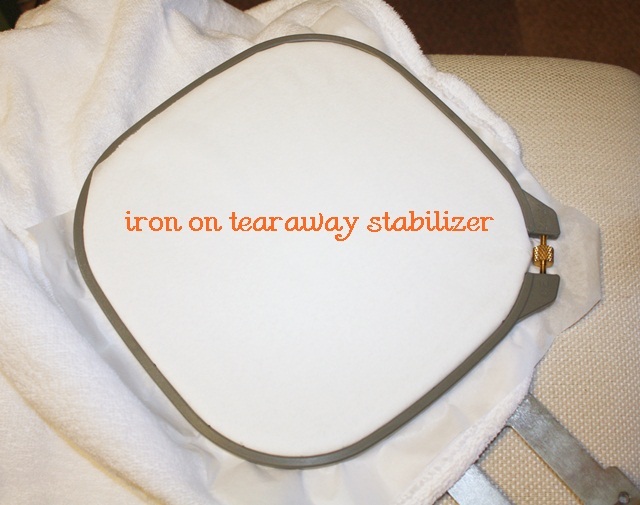 I don’t want stabilizer left on the back of the towel when I’m done so I’m using an iron on tearaway stabilizer. I cut a piece the size of my hoop and iron it on the back where the monogram will go. This kitchen towel is pretty flat (not fluffy), but it was a tad bumpy and “waffle weave” so I decided a layer of solvy would not hurt! As you can see the monogram is sewing on top of the solvy. I hooped the solvy too. Now I’m doing a bath hand towel, so again I’m using the iron on tearaway because I do not want stabilizer left on the back of my towel. I iron it on the back the size of my hoop over the area that will be monogrammed. If I were to monogram this without solvy, the thread would get lost and buried down in the loops. 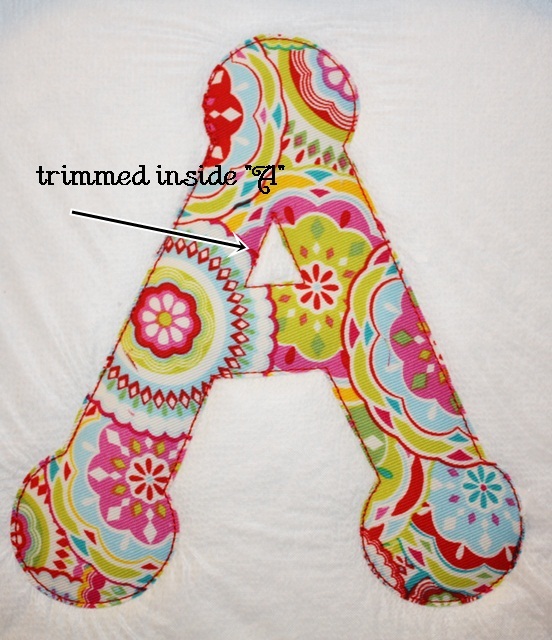 As you can see below the monogram is sewing on top of the solvy, therefore on top of the loops of the towel. 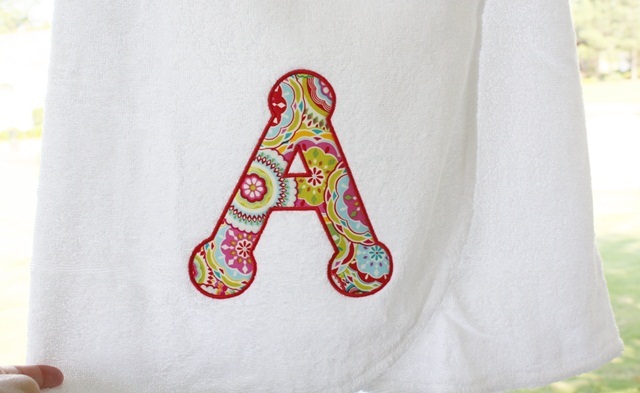 Note: I like to use a fill stitch monogram when doing towels versus a satin stitch. That’s just my personal preference! Other than Heat N Bond Lite (see this post) and Sulky KK5000 Spray Adhesive (see Hooping 101 post ~ I use it to stick my cutaway to my shirt before hooping) and a lint brush, these are the only “products” I typically use. I post last week about needles and other than scissors, measuring tape and my iron, that’s about it! I can do another post soon on embroidery thread and bobbins! 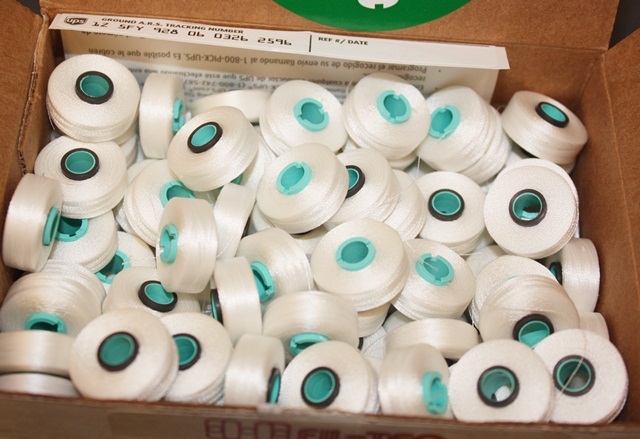 FYI – I use Fil-Tec’s Magnetic Core Bobbins from Sewingmachine.com. You can buy a box of 100 for like $28.00. 100 bobbins lasts me a long time! 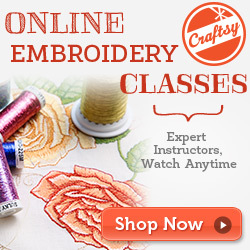 I hope this helps those of you who are thinking about embroidery or just starting out. Like I said, there are TONS of stabilizers out there and there are several that I simply don’t use. You kind of have to figure out what you need and like and stick with them. The commercial stabilizers are priced so great so I buy them on the stabilizers I use the most. I also did a post last week on Comfort Cover (see the post here). It’s not really a stabilizer, but more an “extra” thing you can add to your finished product! If you have any other post ideas for “beginners”, please let me know!